Shale shaker is a general term for a vibrating device used to screen solids from a circulating drilling fluid. The majority of shale shakers flow the drilling mud over a rectangular screening surface. Larger solids are removed at the discharge end, with the smaller solids and drilling mud passing through the screens into the next solid control equipment. All drilling solids above 74 microns are considered undesirable in any drilling mud. For this reason, the meshes with 74 microns screens are extremely desirable on shale shakers. Screens this size may remove large quantities of barite, which may significantly decrease well cost. 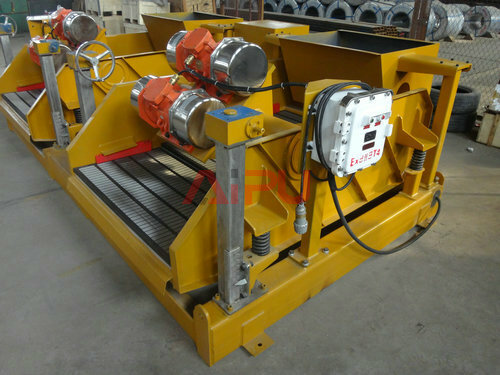 A shale shaker can be used in all drilling applications where fluid is used as the drilling mud .Screen selection is controlled by the circulation rate, shaker design, and drilling mud properties. Screen selection for shale shakers is also dependent on geographical and geological location. Shaker screen combinations that will handle specific flow rates in the Middle East, for example, will not necessarily handle the same flow rates in Russia. Adjust the specification of screens with the variation of the lithology, drilling rate, well depth and the type of drilling fluid. Choosing the effective screens with fine mesh as far as possible. The flow area should cover from 75 to 80 percent of the total screen area at the normal drilling rate. The drilling fluids pumped out of wellbore should be treated by drilling fluids shale shaker as the primary purification process, and keep 100 percent utilization of shale shaker. Shale shakers are the most important and easiest solids removal equipment, which is characteristic by highly cost-effective. However, the next stage solids removal equipment will not perform effectively, if shale shakers are used incorrectly. Aipu can provide high performance shale shaker and whole solids control equipment for you. Aipu solids control mud recycle and drilling fluid purification equipment will separate the solids within the returned fluid, conducive to the stability and performance of the drilling fluid and can reduce the cost of drilling, and are environmentally friendly.